For 59 years, John Dingell Jr. represented Michigan. 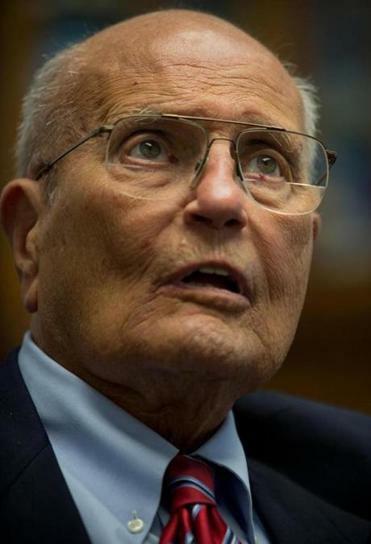 John D. Dingell Jr., a powerful and tenacious Michigan Democrat who pushed landmark legislation, exposed corruption in government and became the longest-serving member of Congress in American history, died on Thursday. He was 92. His wife, Representative Debbie Dingell, announced the death in a statement. Debbie Dingell, who won election to his seat after he announced his retirement in 2014, said this week that she was at home with John Dingell, whose health had been failing. Representative Dingell (pronounced DING-gull) had represented what is now Michigan’s 12th District, outside Detroit, since the Eisenhower administration, a 59-year run. But when he announced in 2014 at age 87 that he would not seek re-election that year, he said he was stepping down because he no longer recognized the institution he loved. Bitter partisanship, he said, was preventing the House from getting anything done. “I find serving in the House to be obnoxious,” he told The Detroit News. Representative Dingell, a physically imposing man of 6-foot-3, weighing 200 pounds and intimidating many with his booming voice, was one of the last of the old bulls, a small cadre of powerful Democratic House committee chairmen who had risen through the seniority system and wielded absolute control of their fiefs. Like the other old bulls, he used his position to protect his hometown interests — in his case, the automobile industry. Some called him the most powerful man in Washington who had never become president. He joined the House on Dec. 13, 1955, filling the seat of his father, John Dingell Sr., who was first elected in 1932 and died in office after serving 22 years. With Debbie Dingell now occupying the seat, someone in the Dingell family has represented southeast Michigan for almost 90 years. John Dingell Jr. became the longest-serving House member in February 2009, surpassing the record set in the early 1990s by Jamie L. Whitten, a Mississippi Democrat. He became the longest-tenured member in the history of all of Congress on June 7, 2013, when he passed the record set by Senator Robert C. Byrd, a West Virginia Democrat, who died in office in 2010. Indeed, tenacity proved to be a distinctive feature of Representative Dingell’s political career, as did a forcefulness that earned him admirers as well as critics. As chairman of the House Energy and Commerce Committee from 1981 to 1995, and again after the 2006 election put Democrats back in power, his unusually vast portfolio allowed him to shape policy affecting energy, the environment, health, telecommunications, transportation, financial services and consumer protection. The committee handled nearly half of all bills before the House each year. His influence was magnified because at the same time, he was chairman of the committee’s oversight and investigations subcommittee, and it was from this perch that he made his true mark. With prosecutorial zeal, he would fire off “Dingell-grams” to government agencies he was investigating. He also could issue subpoenas and hold hearings, and he exercised that power to maximum effect. Among his achievements were enhancing the safety of blood banks, bottled water and pacemakers and exposing waste, fraud and abuse throughout the federal government. In the early 1980s, his committee uncovered the Pentagon’s slack procurement procedures, including its payment of $640 for a toilet seat. It also confirmed allegations of conflicts of interest within the Environmental Protection Agency, forcing the resignation of Anne Gorsuch Burford, President Ronald Reagan’s first EPA administrator. Representative Dingell’s reach — some called it overreach — extended to the scientific community, and he was sometimes accused of acting as “the science police.” His aggressive tactics unsettled many in Washington, and not all of his investigations were successful. In the early 1990s, Representative Dingell engaged in an epic battle with David Baltimore, a Nobel laureate, over allegations of faked research in a paper that Baltimore had co-written. Baltimore was not accused of fraud but of misplaced loyalty to his co-author, and the controversy forced him to resign as president of Rockefeller University in 1991. In 1996 he was vindicated by an appeals board at the National Institutes of Health; the scientific community widely agreed that the paper contained errors, but that it had not been intentionally fraudulent. Bernadine Healy, then the director of the NIH, was among those who dared to chastise Representative Dingell publicly, accusing him of using his “virtually unchecked power to investigate, prosecute and judge” his targets while running roughshod over due process. The Washington Post editorialized that “congressional chivvying of this kind,” with Representative Dingell appearing “to be persecuting Dr. Baltimore for no purpose,” would not bring about constructive change. Back in Michigan, Representative Dingell served the politically disparate needs of his district, which spanned the blue-collar, Roman Catholic neighborhoods of autoworkers in Monroe and Wayne counties and the tony neighborhoods surrounding the University of Michigan in Ann Arbor. The district was almost all white and heavily Polish (as was Representative Dingell’s grandfather, who changed the family name from Dzieglewicz). An avid hunter — he kept fish and game trophies in his office, including that of a 500-pound boar he reportedly killed with only a pistol — Representative Dingell defended the right to bear arms and received an A+ rating from the National Rifle Association, of which he was a member. This put him at odds with many Democrats, particularly gun-control advocates from urban areas like Detroit, but hunting was important to his working-class constituents. But his chief constituency was the auto industry, and Representative Dingell was among its most stalwart champions. He viewed taking care of the industry as one of his primary legislative responsibilities. He advocated bailouts of General Motors and Chrysler and long staved off calls for tougher emissions and fuel economy standards. John David Dingell Jr. was born on July 8, 1926, in Colorado Springs, Colo. His family moved back to Michigan, and John Sr. won his House seat. His wife, Grace (Bigler) Dingell, raised John Jr. and his siblings in Detroit and Washington. When he turned 18, Representative Dingell joined the Army in 1944; he rose to second lieutenant. The following year he was supposed to be in the first wave of soldiers in Japan. “I had my orders to go when Truman dropped the bomb on the Japanese, and that ended World War II,” he said in a 2006 oral interview with the Edward M. Kennedy Institute for the US Senate. Back in Washington, Representative Dingell earned an undergraduate degree in chemistry from Georgetown University and a law degree from Georgetown Law School, graduating in 1952. He worked as a forest ranger, a Wayne County prosecutor and briefly as a private lawyer before winning his father’s congressional seat, in what was then the 15th District, when he was 29. Representative Dingell’s first marriage, to Helen Henebry in 1952, ended in divorce two decades later. In 1981, he married Deborah Insley. In addition to his wife, he is survived by three children from his first marriage: Christopher D. Dingell, a former state senator and Michigan circuit court judge; John D. Dingell III; and Jennifer Dingell. His daughter Jeanne Lagodka died in 2015. He is also survived by a brother, James V. Dingell Sr., a sister, Jule Walowac, and three grandchildren.